#BayerExpertCare products are helping me eliminate winter’s itchy, dry skin on my pets! It’s that time of the year again – the leaves have fallen from the trees; the mercury is dipping in the thermometer; the furnace is running; and I have my wood cookstove in the kitchen perking away for a little extra warmth. Oh yes, and I can hear the thump, thump, thump of Malibu and Gemma’s hind legs as they scratch. As we have wood floors, the thumping can wake you from a sound sleep. Here in the Maine North Woods, it gets pretty cold in the late fall and winter so we supplement our regular heating with wood stoves. Great warmth but it makes for a real dry, itchy skin problem for the entire family, both two and four legged. 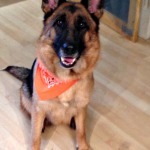 For our German Shepherds, Malibu and Gemma, the skin issues can be bad. Gemma just had a vet appointment last week because she was nibbling so bad I found some crusty abrasions on her skin during grooming. Doc Nesin prescribed a round of prednisone. He also suggested getting some itch relief products to use in the daily grooming process to help eliminate those dry, flaky, “hot spots” that Gemma seems so obsessed with. Road Trip with Malibu to PetSmart! So it was off to my local PetSmart to see what I could find to help my poor itchy girl out! 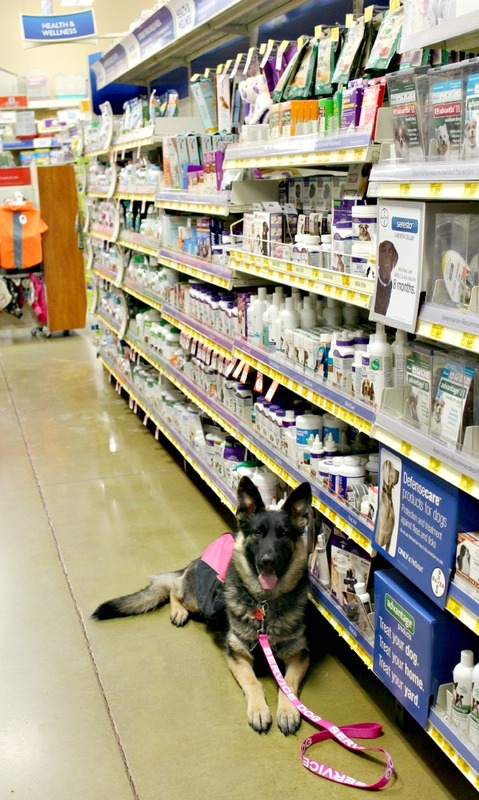 Of course, Malibu, my service dog accompanied me, she loves PetSmart. Her nose is always held high as she air scents the aisles of pet food. 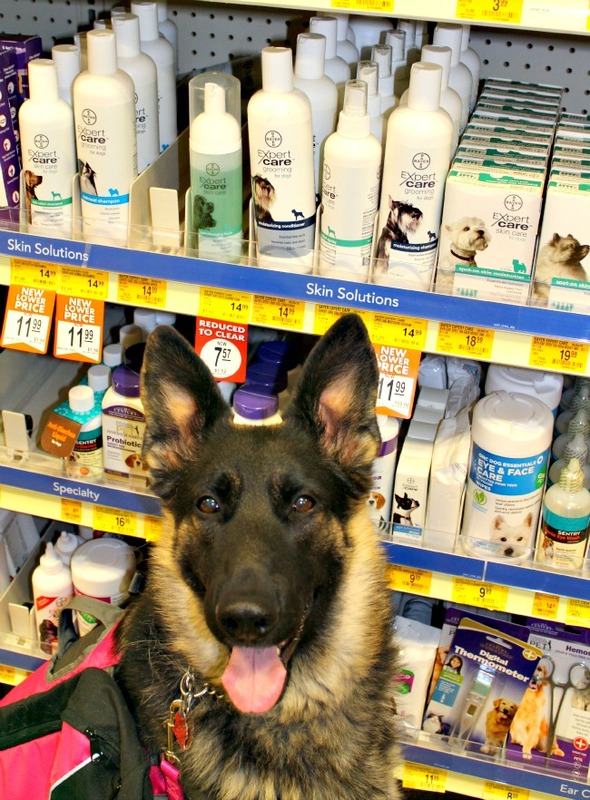 I found what I was looking for in the PetSmart Health and Wellness aisle – Bayer® ExpertCare™ Itch Relief Spray in the Bayer® ExpertCare™ Skin Care for Dogs line of products available exclusively at PetSmart. The label says “Temporary relief of itching and flaking” and that’s just what I needed. Further reading told me that Bayer ExpertCare Itch Relief spray combines Pramoxine and micronized colloidal oatmeal in a moisturizing base. It works in 3 – 5 minutes of spraying it on the affected area. It’s simple to use – just spray it directly on the affected area. Because of Gemma’s thick coat I have to spread the hair with my fingers so of course I get some on my hands. I could even feel the moisturizing affect on my hands. It’s formulated with rich Omega-6 fatty acids to help maintain the skin’s natural barriers, moisturizers and coat conditioners in a hydrating medium. And oh, it smells so good! 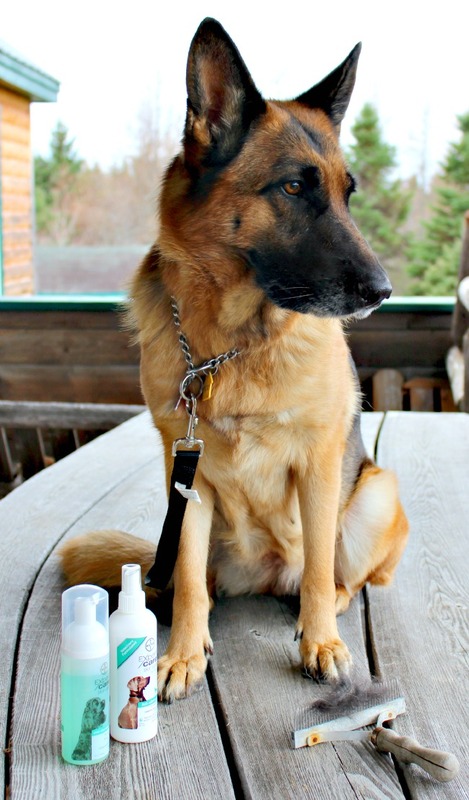 Shampooing A Dog without the water – great for dry, flaky dog skin in the winter! 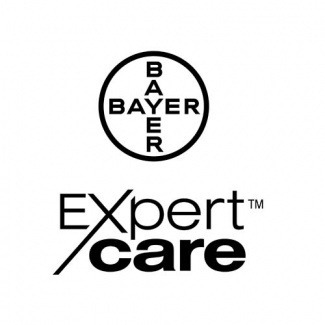 I also grabbed a bottle of Bayer ExpertCare Coat Cleansing Foam for dogs. 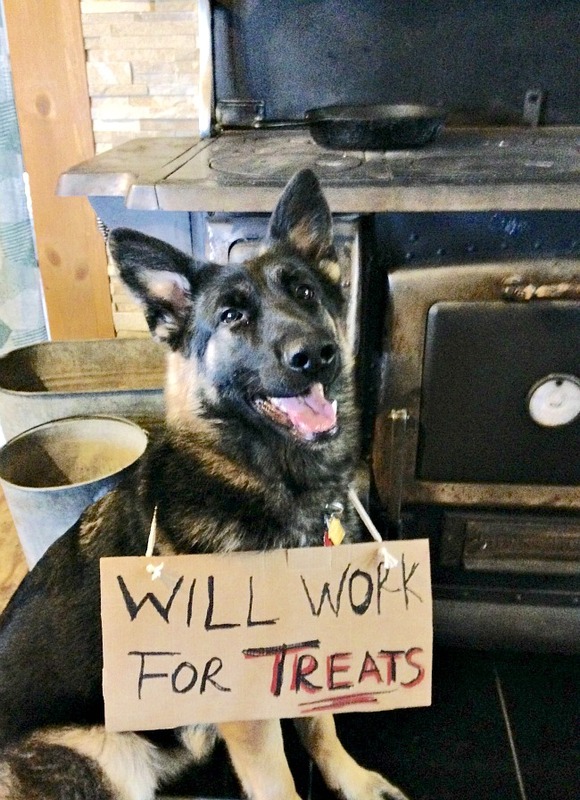 German Shepherds can get very “doggy” smelling. 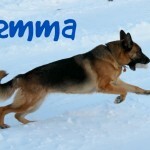 Gemma, in particular, as she is a search and rescue dog who is out in the wet a lot can get very smelly. Last week she came in from her evening “potty” tour having encountered a skunk which adds to her aroma even though I had bathed her using a skunk odor eliminating remedy. There has been a slight “air” about her when she gets wet. During her very necessary daily brushing (the breed is nicknamed “German Shedders”), I tried the Bayer ExpertCare Coat Cleansing Foam. Wow! I love this stuff. It’s soap free so there is no need to get the dog wet or to rinse it out. You just spray it into your hand and then work it into the coat. I then use the brush to comb it through the hair and work it down into the coat. After I am done I just wipe her down with a towel to remove dirt and we are done. Its quick and convenient, and its formula hydrates the skin. And boy, her coat shines beautifully since I have used it. I’m a fan! It’s #BayerExpertCare for me! 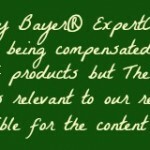 The Bayer ExpertCare line of pet products has solved two problems for me – dry skin and a dull, smelly coat. These products are providing quality care for my girl, Gemma. On my next trip to PetSmart I will be checking out more of their products for the rest of the 4-legged family members. It’s reassuring to know that grooming for dogs and cats is improved with products that are specially formulated for dogs and cats.